Lisa Mackenzie at Camper & Nicholsons tells me of a significant price drop on Jeremy Comport's central listing, the 47.5m motor yacht Lady Dahlia. Built by ISA under close supervision by an experienced owner, she was launched in 2005 to Lloyds class and MCA compliant. Lady Dahlia has an extended upper deck and sun deck with custom made furniture for perfect outdoor relaxation and dining. This superyacht has a spacious and comfortable sky lounge, as well as a full beam master cabin, four additional guest suites and a fully equipped gym. 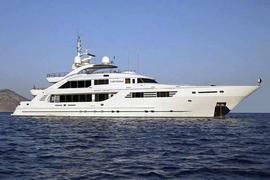 The asking price of Lady Dahlia is now down from €16.75 million to €14.5 million.